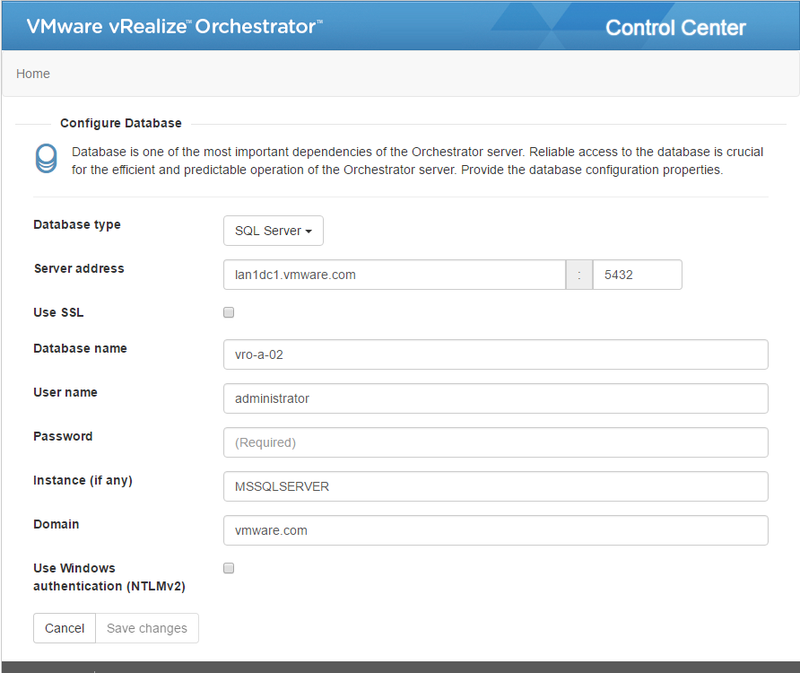 In this article we will look into how to migrate the VMware vRealize Orchestrator (vRO) database to new server. In particular we will migrate from Microsoft SQL Server 2014 to a new SQL Server 2016 server. 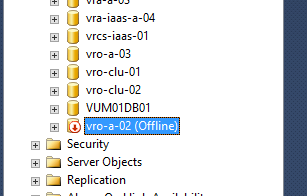 For the purpose I have a vRO 7.1 (vor-a-02) configured with SQL Server 2014 DB running on a Windows Server (lan1dc1.vmware.com). I will migrate the Database to a new SQL Server 2016 DB running on a second Windows Server (lan1dc4.vmware.com). 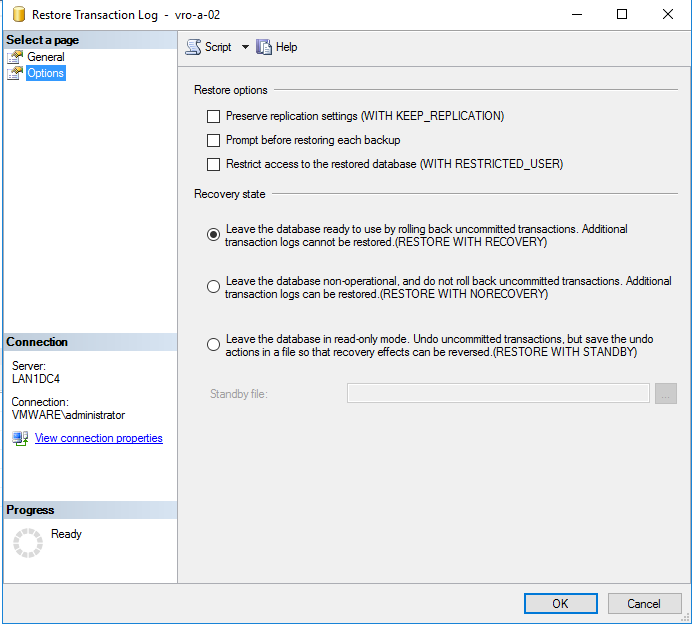 I will use an SQL Server Migration Test workflow very similar to the Cluster DB Test workflow we used in Clustering the vRO Cluster Database using SQL Server (PoC) (SKKB1027) with a couple of differences explained below. Drain out Load Balancer connections to the vRO server/cluster. Verify there are no more running workflows. Put the source database in an offline mode. 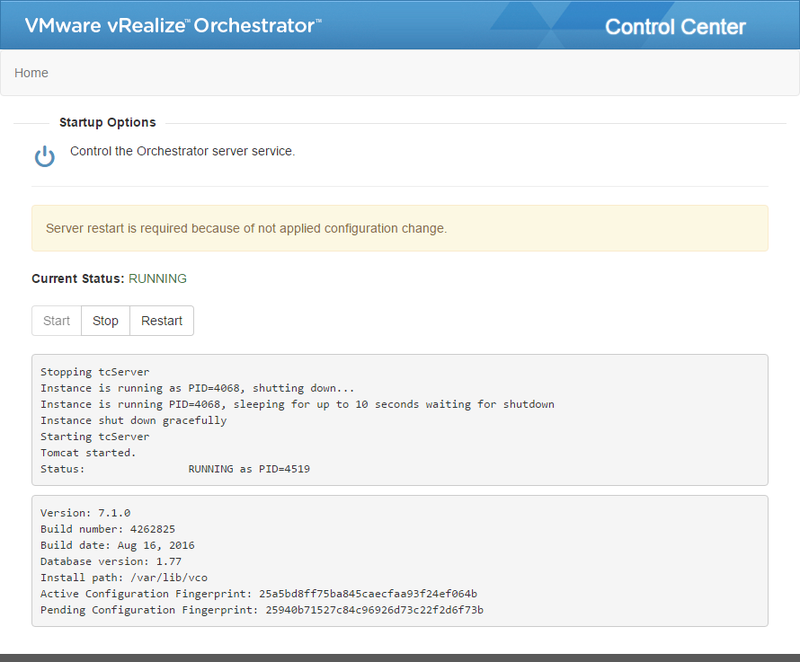 Change the database configuration from vRO Control Center. Enable Load Balancer connections to the vRO server/cluster. Most load balancers, even the most basic once , offer option to drain existing LB connections and at the same time block new once until you enable them back again. At this step drain out connections to the LB address of the vRO/vRO Cluster. After draining out the connections to the vRO/vRO Cluster from your LB, monitor the execution of existing WF’s and make sure they all finish before you proceed. 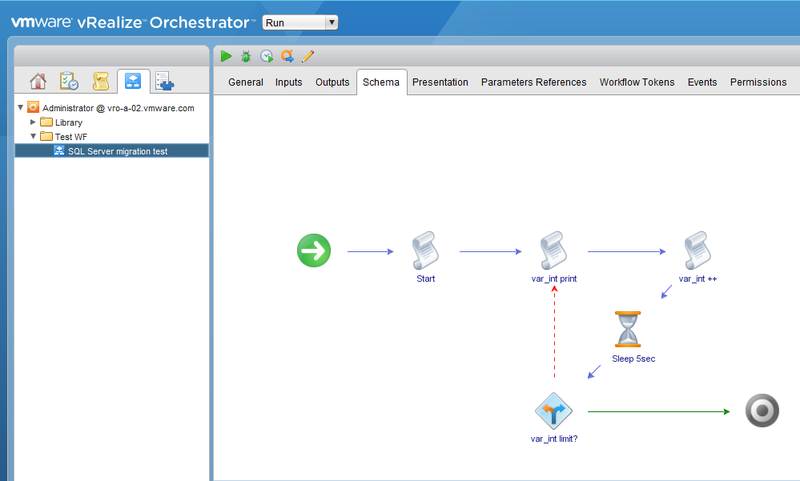 If you are not using load balancer and you are not the only administrator using vRO you should find a way to inform all other vRO users to finish work and close all existing client connections. netstat -np tcp | grep "<vRO_IP>:8281"
The following screenshot shows that there are no running wf’s . 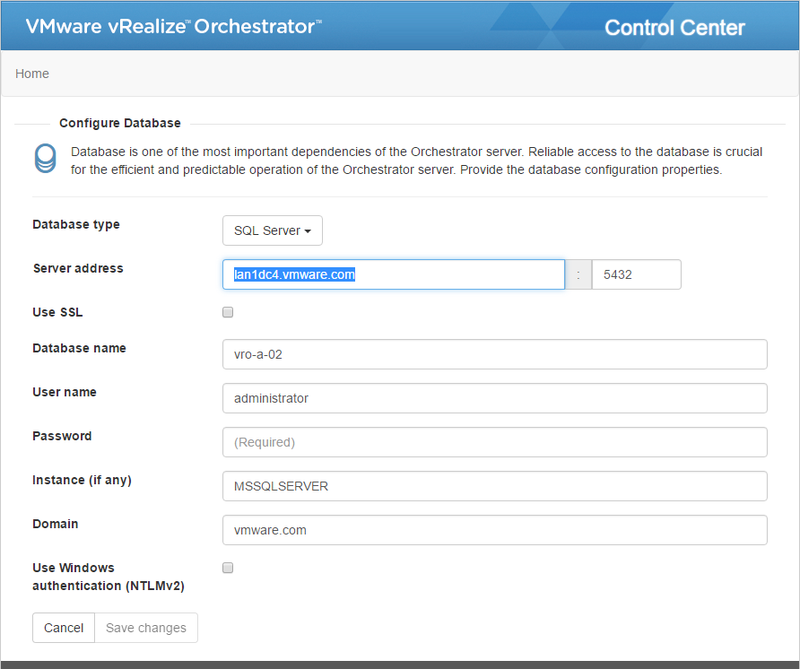 The following screenshot shows the existing database configuration before the migration. Note that I’m not using SSL for the DB Connection. If you use SSL there is one additional step you have to perform on the destination database server as described later in this article. The following step is not mandatory. 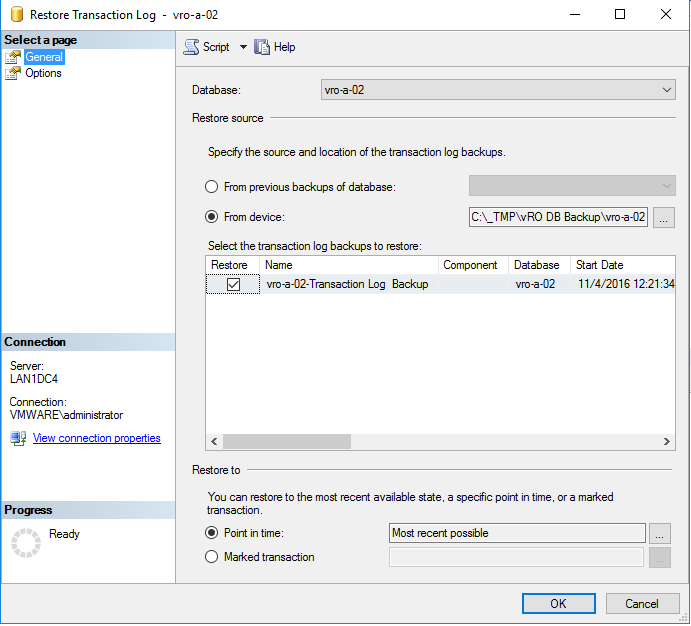 I will use an SQL Server Migration Test workflow very similar to the Cluster DB Test workflow we used in Clustering the vRO Cluster Database using SQL Server (PoC) (SKKB1027) with a couple of differences. For the purpose of these tests I’ve buid a very simple SQL Server Migration Test WF that increments a number from 0 to 300. Each time it does this the WF creates a couple of System Logs (stored on vRO Appliance and seen on Logs tab) and a couple of Server Logs (stored on DB and seen on the Events tab). I’ve split the action in multiple scriptable tasks. I’ve done this because each time a scriptable task executes and finishes it reads and writes to the DB. I wanted to have a constant communication to the DB. This workflow differs from the Cluster DB Test workflow only in that has an additional Timer taks that sleeps the WF for 5 seconds. I don’t want to overfill the logs . Following screenshots shows the WF schema. The following screenshot shows those changes. For more information about the WF refer to the article above. Now, as a final step before shutting down the vRO appliance, I will start our SQL Server Migration Test WF. I will not wait for it to complete but rather shutdown vRO right away. At this point of the migration, vRO should be completely shut down. On the source database server perform a full backup of the vRO database and of the transaction logs (in that order) as shown on the following screenshots. 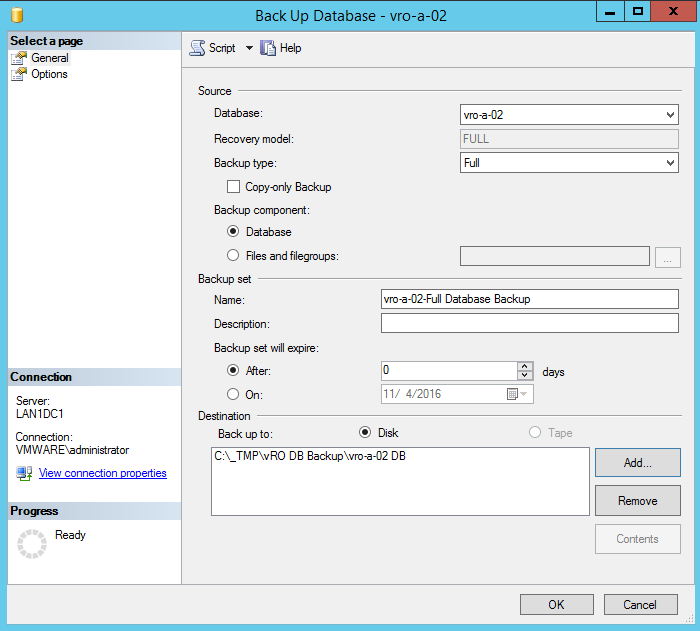 On the destination database server perform a full backup restore of the vRO database with the RESTORE WITH NORECOVERY option as shown on the following screenshot. On the destination database server perform a restore of the transaction log backup as shown on the following screenshot. 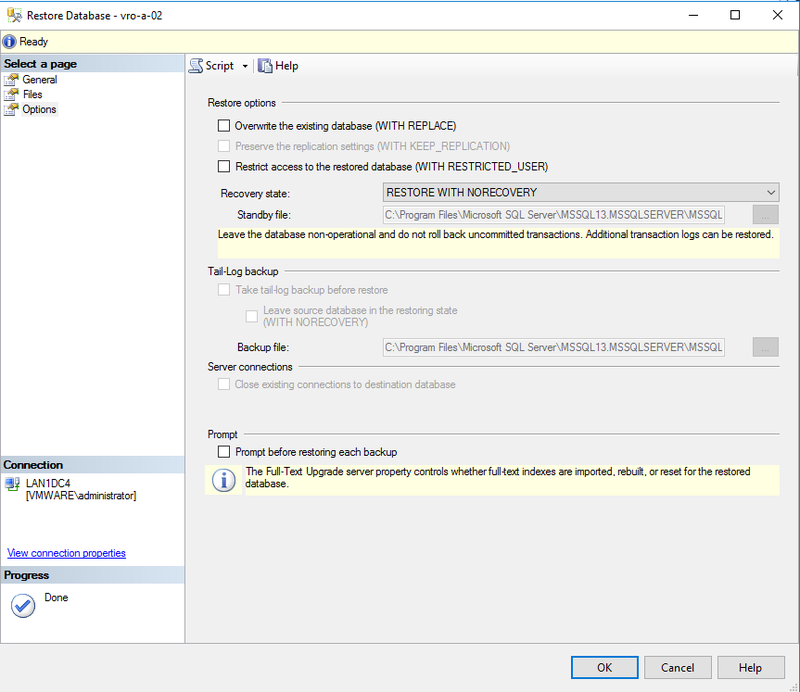 If you are using SSL for the connection b/n vRO and the SQL server make sure to configure the destination database server to accept SSL connections. On the source database server put the vRO database in offline mode as shown on the following screenshots. This completes the SQL Server migration. At this point you should have migrated the SQL database to a new server. Next we need to point vRO to the new database server name. 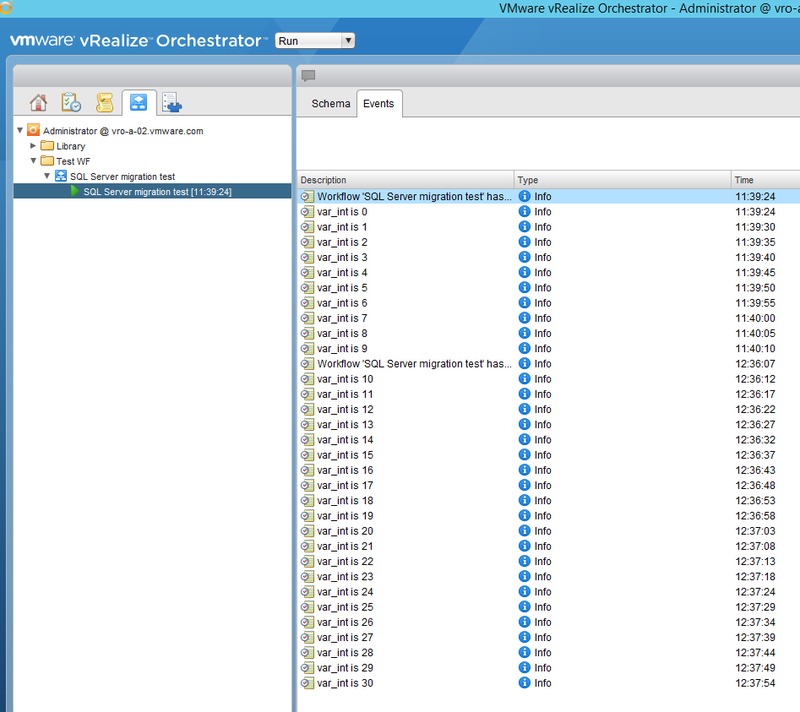 Power on the vRO appliance and change the databse configuraiton from Control Center. Restart the vRO Server Service. 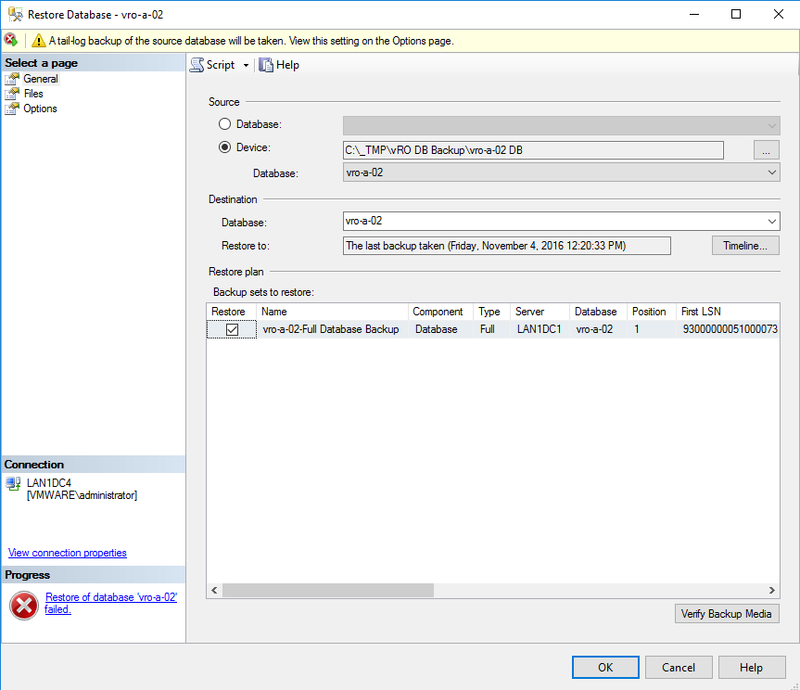 Optionally, login to vRO and check the SQL Server Migration Test state. As you can see from the following screenshot after vRO rebooted (now connected to the new DB) it resumed the WF execution from the last point. Nothing was lost. You can check the vRO Logs for any errors. I’ve done so and haven’t seen any. Enable connection to the LB address of the vRO/vRO Cluster. This entry was posted in Database, Microsoft, SQL Server, SSL, vRO and tagged database, migration, orchestrator, SKKB1032, sql server 2016, vmware, vro. Bookmark the permalink.